Have you ever imagine become mermaid? Swim together with hundreds fish and other marine biotas? In Bunaken Sea Park you will find real "mermaid" and see the richness of Indonesian sea. Bunaken is located in Manado bay with an area of 8,08 square kilometres, located in the north of Sulawesi island, Indonesia. Bunaken is part of government of Manado city, mother city of North Sulawesi. Marine park around Bunaken is part of National Park that also include of the sea around Old Manado island are Siladen and Mantehage. 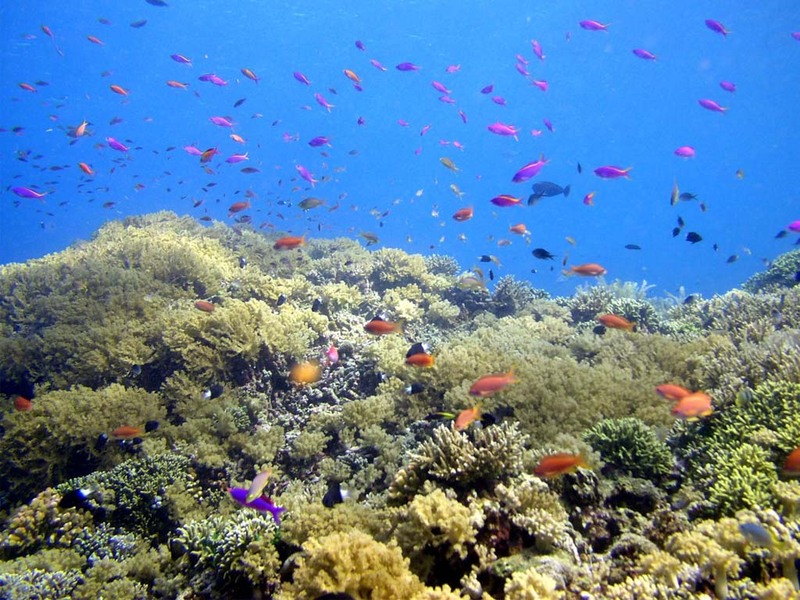 In Bunaken Marine Park, visitor can see various amazing marine life and also full of colour. To reach the marine park, you can use motor boat. Travel from Manado needs 40 minutes. The fee entrance is Rp 25,000 / person. Bunaken sea waters allow people to see clearly various types of sea biota.There are 13 types of coral reef in the marine park, which is dominated with sea stones. The most interesting scenery is vertical coral reef towering down as deep as 25-20 metres. Treat your eyes with 91 types of fish at Bunaken Marine Park like sea horse (Hippocampus), white koi (Seriola rivoliana), yellow-tail lolosi (Lutjanus kasmira), goropa (spilotocepsep hinephelusdan hypselosoma Pseudanthias), and a type of tilapia (Scolopsis bilineatus), and many more. Diver also can find molusca like giant kima (Tridacna gigas), goat-head fish (Cassis cornuta), nautilus (Nautilus pompillius), and tunikates or askidian. For you who love scuba diving then this place is the good place. There are 20 dive spots, where the divers will get opportunity to swim in sea floor surrounded with various types of amazing marine biota. Make sure you visit Bunaken at the best time between May until August. On this month, you can explore whole beautiful marine park. Diving is the best way if you want to enjoy intactly and clearly the panorama of Bunaken underwater life. Available 23 places of snorkeling or diving. Don't be bothered to bring your own diving equipment because of Bunaken provide diving equipments to be rented at a price of Rp 100.000 / day. Not only see row of colorful fish swim back and forth and seagrass meadows, you also can se more than 390 species of amazing coral reef. Its form is unique and squiggly. Also you can see marine cave or tiny tunnel that might be impossible to be found in another place. Under the stretch of sea by an area of 890,65 square kilometres in the region of Manado bay, we will find the beauty enchantment created by our God by enjoying the colorful coral reef. There are more than 200 species of fish also a variety of another marine biotas. You will feel diving sensation surrounded with dazzle underwater sceneries at the park that is located 75 mile from Manado beach. The dive sites can be reached by a travel of 35 minutes by using motorboat. 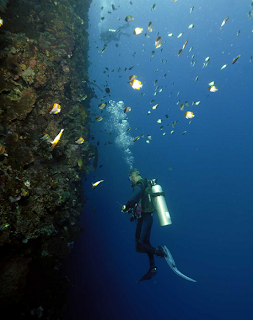 Many best dive sites are located near Bunaken or Old Manado. Here the list place that represent the location of the diving. Lekuan Wall (I,II,III) is a long wall in Bunaken that is divided into three, Lekuan I, II, and III. All three have the best marine park with steep walls and deep crack, also sea fan and giant sponge. A shallow place filled by fish. The wall, always protected from strong stream, which is always visited by group of large parrot fish and turtles. Mandolin in marine park that has coral summit and walls that inhabited by thousands fish like group of gunner fish, surgeonfish, unicornfish, and bannerfish. They can swim and easy to be approached. Bunaken Timor has strong stream with many fishes. Coral reef maybe not as spectacular as in another place but you can see turtle, shark, stingray, and large fish swim back and forth here. Also there are seagrass and small caves. Tanjung kopi is small wall that is inhabited by a group of barracuda fish and many sweetlip fish. The visibility in shallow water is not good enough but the amount of fish will make you be interested. Nudibranch fish and api gopi fish will be easy to found here. Siladen has beautiful smooth coral wall that will alive when the stream comes. Shallow sea looks beautiful with many fishes and snappers. Muka gereja is beautiful place with thousands fish in shallow waters and trench that is leading to sea wall. Puncak Barakuda in the northwest is one of the farthest place. A group of giant barracuda are located between jack fish and tuna fish. A long ship by a size of 60 m (200 feet under the sea level) was owned by German trader, sink near Molas beach in 1942. This ship is sink upright in a depth of 23 m (78 feet under sea level). Split at the middle part of the ship and displays the wheelhouse and cargo handle. Diving activity ends near the shallow coral. Bunaken's enchantment not only at its marine park but at the surface we can enjoy the beauty and exoticism of five islands that are Bunaken island, Siladen island, Manado Tua island, Nain island, and Mantehage island. In the last island there is Bajo tribe with their unique culture. Other than diving enthusiasts, ornithologists and amateur bird watchers might find visiting Tangkoko Dua Sudara Nature Reserve entertaining. Bunaken National Park was built in 1991 and it's one of the first marine park in the world. In 2005 Bunaken has become world heritage site after registered by Indonesia in UNESCO. Bunaken National Park is divided into two parts, that are in the north and south. In the northern part consist of 5 islands, and littoral between Molas until Tiwoho called Pesisir Molas-Wori. In the southern part consist of coastal between Poopoh village and Popareng village called Pesisir Arakan-Wawontulap. In this region, there are 22 villages by the amount of its citizen are 33 thousand people. Mostly are farmer and fisherman also 25% of its population works in tourism sector. You can explore island by walk or use boat to move from one place to another place. Even when you only walk and go around along the beach, it will become enjoyable experience. So, diving is not the only choice. Another way are by using semi-submersible vessel, which is rented in the offshore of Bunaken island. The ship provide glass walls so you can see and enjoy the beauty and exoticism of Bunaken's sea floor. Also there is Blue Banter submarine and it will be operated when the sea in high tide. Many sceneries that you will get maximally though its fare is more expensive than semi-submersible vessel. In Bunaken, you'll feel like in paradise where the underwater paradise located under the Manado bay surrounded by the beauty of flora and fauna over there. To reach Manado, many airlines serve routes start from Jakarta, Denpasar, Makassar, and Sorong/ From Jakarta, you can choose Garuda Indonesia that will fly twice a day, Lion Air fly three times a day and Batavia Air fly twice a day, and it needs 3 hours. The admission and ticket can be bought through tourist operators in Manado or Bunaken National Park. Also, you can buy them in one of three ticket counters in Bunaken and Liang villages at Bunaken island and Siladen island. You have to realize that during the holiday season between July and August, the situation will be very crowded, full of domestic and international tourists. Many resorts and dive operators can't recieve the tourist to enter at the time. So, better if you book it before the holiday season comes. For the place of boat rental from Manado to Bunaken, you can choose Pasar Bersehati and Marina. Fare of boat rental from Pasar Bersehati, Manado to Bunaken is between Rp 300.000 to Rp 400.000. While if you from Marina, the fare is more expensive, start from Rp 600.000 to Rp 800.000. The most economical way is merge together with other tourists by using traditional boat by a fare of Rp 50.000 / people. But you have to wait until seats on the boat full of passengers, then the ship ready to sail to Bunaken. Try to rent equipment from the large company that can be relied but remember that the responsibility to check your equipment is depend on your self. If you're the true adventurer, of course you won't skip to continue your nautical adventure in Raja Ampat and Wayag island, at Papua. For accommodation, in this island you can choose inn by a price start from Rp 40.000,00 per people per day, include complete facility. Several dive operators in Bunaken offer you the accommodation more expensive with adequate facilities.Also, you can choose to stay at hotel in Manado city then book the daily package to Bunaken. Usually, they leave in the morning and back in the afternoon.